The Kresge Self-Guided Tour is designed to lead you through the College’s many important areas and small niches. Follow the numbers from 1-7 to discover our College including academic and residential life and recreation. Each area is described by number inside. Please know as you explore Kresge and UC Santa Cruz, we are proud to be a smoke and tobacco free campus. This is the social hub of the college. The College Programs Office develops and leads many fun and engaging events each year and checks out movies, recreation equipment and games. The Town Hall is a performance center where concerts and other events happen regularly. Directly behind the Town Hall is the Kresge Music Co-op where students play amplified instruments not permitted in the apartments. Located next door to the Town Hall is our college café, The Owl’s Nest, a sunny spot for good food, coffee, tea, smoothies and an array of healthy, vegan and vegetarian options. Across the way, in Apartment 714, is the campus CARE Office. Professional and student staff serve with preventative outreach, collaboration and care. The Kresge Food Co-op sells natural and organic foods. Anyone may buy food at the Food Co-op, while members receive a discount. The Co-op operates as a collective with a variety of membership options. Kresge buildings J & K, our three person apartments for upper class students, are located here. Across the way is the I-Lounge where students may relax, study or attend a wide variety of events and activities. Many of our six-person “flats” are located here. Also available are the building three “suites” that house nine people. A card operated laundry room is in the center of Lower Street, as well as our computer lab with 16 PCs and printing available during posted hours. This is the entrance to our college and a popular spot with our students. Students socialize, study or just relax here. As you walk from Lower Street to the Piazzetta, the diagonal ramp to your left leads to the STARS Offices (Services for Transfer and Re-entry Students) and the Common Ground Center. In the Piazzetta, you will find our College Office where students go for academic information and assistance. Directly to the side of this office is our College Provost House where the academic head of the college, the Provost, resides. Also in this area is the college mailroom where students receive all their mail and packages. Upstairs is the Kresge Photo Co-op, a black and white processing darkroom and the Seminar Room 159. The Veterans Resource Center, that provides assistance and support for veteran students, is located here directly next to the Student Lounge. The lounge features a large screen TV and comfortable furniture for relaxing and socializing. Upstairs is a full kitchen and bath area, intended for our commuting students to stop in between classes to relax and refresh. 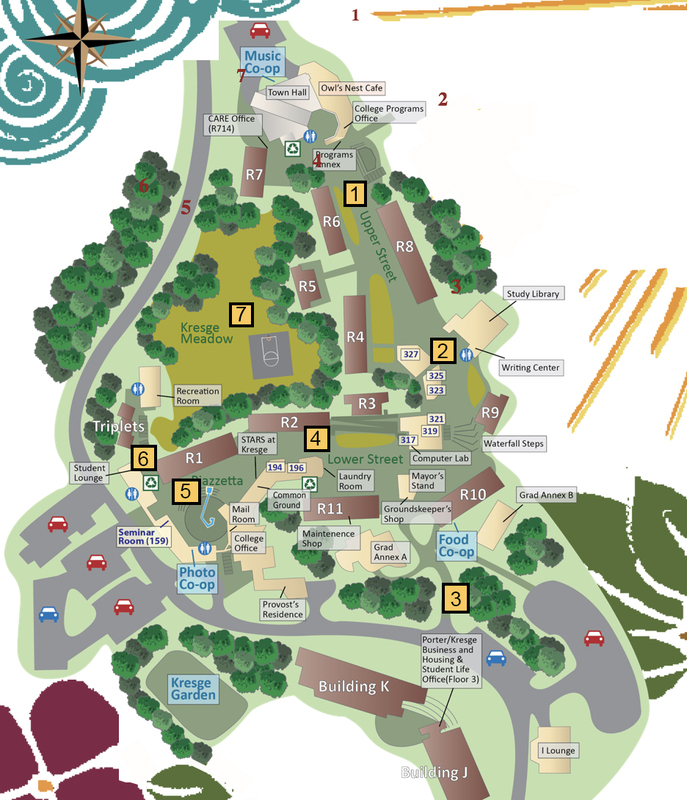 In this area you’ll find our Recreation Room and Kresge Meadow. The Rec. Room has comfortable furnishings, a pool table, foos ball, air hockey and darts. There is also wireless network access for students use and a half basketball court. Another housing option here are the “Triplets”. These three apartments house 3 students each. We hope you’ve enjoyed your walking tour and our college! Thank you for visiting and have a wonderful day! Click here for a PDF copy of our Self-Guided Tour Pamphlet.